The international arbitration of disputes between investors and states has been a controversial issue in Europe, notably in relation to trade deals such as the proposed Transatlantic Trade and Investment Partnership (TTIP). But as Julian Donaubauer and Peter Nunnenkamp write, many commonly held beliefs about investor-state dispute settlements are potentially misguided: European investors appear to be more litigious than non-European investors, and investors win surprisingly few disputes. Public debate in EU countries has conveyed the impression that mainly US-based companies revert to international arbitration of investment disputes, while mainly EU governments would face compensation claims and feel the regulatory chill. What is more, private arbitrators with considerable financial interest in serving corporate clients would systematically favour the claimants and take position against respondent states. In striking contrast to what public debate suggests, the collection of information on almost 800 cases of ISDS since the 1990s by the United Nations Conference of Trade and Development (UNCTAD) reveals that European investors clearly outnumber private claimants from other regions. European claimants have been involved in 58% of all disputes listed in UNCTAD’s database. 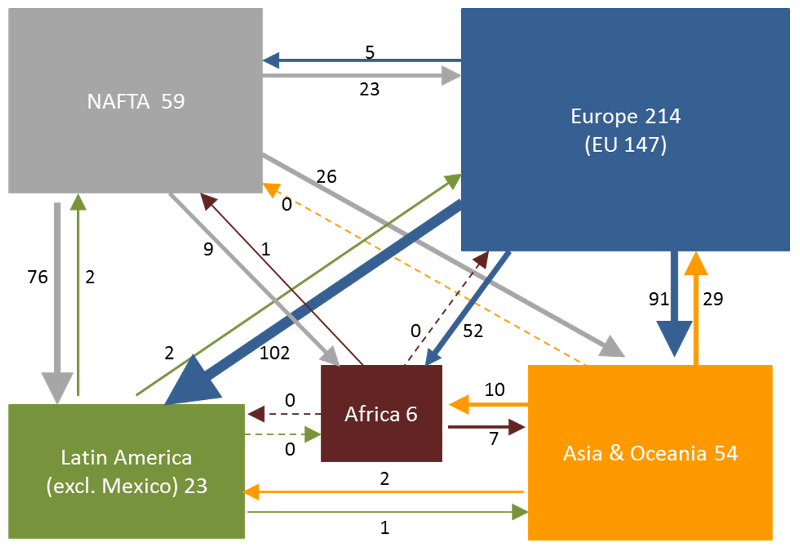 Figure 1 shows that European investors, and among them primarily EU investors, raised 250 claims for compensation against non-European respondent states, compared to 134 claims by the three NAFTA members against third countries. At the same time, Europe stands out in terms of intra-regional disputes brought to international arbitration. About one third of all disputes included in the database were brought against European respondent states; most of these disputes (214 of 268) were initiated by European claimants. One may suspect that European investors are no more litigious than non-European investors when accounting for differences in outward investment positions. Obviously, the number of disputes may increase more or less proportionately with stocks of foreign direct investment (FDI) held abroad. However, even this relative perspective underscores that European investors are far more active as claimants in ISDS than investors based in NAFTA member countries or in Asian countries. European investors, rather than American or Asian investors, are also to blame for raising a relatively higher number of disputes against European respondent states, when accounting for the distribution of Europe’s inward FDI stocks from different sources. Non-EU claimants initiated 1.85 cases of ISDS against EU countries per 100 US$ billions of FDI stocks held there – considerably fewer than the corresponding number of 2.48 cases initiated by EU claimants against EU countries. Focusing on intra-EU disputes, most claims (84%) for compensation were raised by investors based in relatively rich EU countries against relatively poor respondent states. In relative terms, i.e., accounting for inward FDI stocks from EU partner countries, the top-10 targets of ISDS within the EU consisted almost exclusively of Central European countries. Intra-EU ISDS involving relatively rich respondent states (such as the prominent cases raised by the Swedish energy provider Vattenfall against Germany) represent a rare exception. It is widely believed that international arbitration of investment disputes generally favours the position of private claimants over respondent states. The legitimacy crisis of ISDS has been attributed to self-interested and biased arbitrators. Empirical tests of these hypotheses are largely lacking, however. Making use of UNCTAD’s data on investor-state disputes, the EU evidence rather appears to be in striking conflict with widely held views. 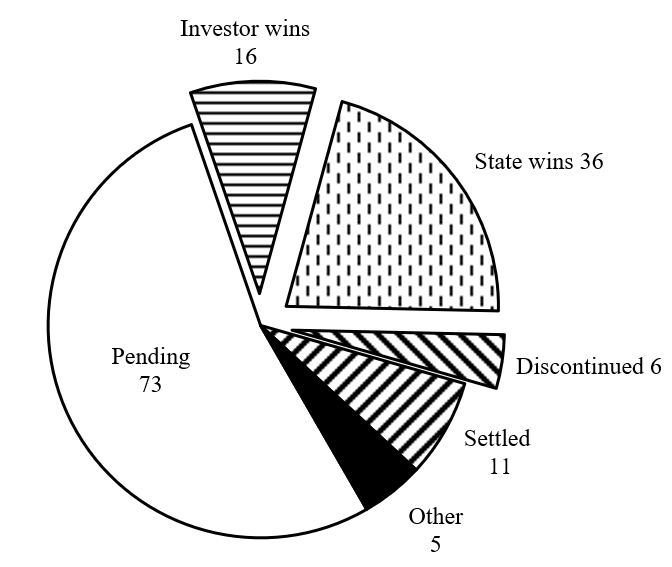 The distribution of already decided cases indicates that private investors win less frequently over respondent states than one might have expected. Outright investor wins account for just 10% of all intra-EU disputes. Even if all settlements granted compensation to investors, state wins would still outnumber outcomes in favour of investors in international arbitration of intra-EU disputes. It should also be noted that discontinued cases tend to be in the interest of respondent states, rather than in the interest of private claimants, notably when tribunals dismiss the case for lack of jurisdiction. Taken together, Figure 2 does not support the view that ISDS outcomes favour private claimants over respondent states. Note: ‘Other’ includes cases with missing information on the status of disputes and cases decided in neither party’s favour. Source: UNCTAD, ISDS database. A possible explanation for the surprisingly low success rate of private claimants in intra-EU ISDS could be that arbitration tribunals are more balanced and less biased than critics suspect. Tribunals typically consist of three arbitrators: one nominated by the claimant, another nominated by the respondent state, and the third serving as the president on whom both parties have to agree. While the president can be expected to have a critically important say on ISDS outcomes, party-appointed arbitrators may shape outcomes if they are experienced in ISDS (i.e., having served as an arbitrator in a larger number of disputes) and specialised (or ‘biased’ in terms of having been appointed more often by investors or states) in serving the interests of one particular party. Comparing the experience and bias of arbitrators, the first thing to note is that state-appointed arbitrators are no less experienced and biased than investor-appointed arbitrators. The presidents handling intra-EU disputes appear to be (almost) impartial. The weak bias of presidents, in combination with the similarly strong and offsetting biases of party-appointed arbitrators, may well explain the relatively low success rate of private investors in intra-EU cases of ISDS. Calculating the ‘consolidated’ bias of tribunals toward investors or states by summing up the individual biases of the three arbitrators, the evidence indicates that arbitration tribunals which tend to be biased toward private claimants are more likely to decide in favour of investors, or to reach settlements which often grant investors at least some financial compensation. In contrast, arbitration tribunals biased toward respondent states tend to deny jurisdiction so that cases are discontinued, or to decide in favour of EU respondent states. The good news for EU respondent states is that private investors win fewer intra-EU disputes than one might have expected. Importantly, however, the outcomes of intra-EU ISDS appear to depend on the bias of arbitrators and the composition of tribunals. This implies that arbitrator selection is critically important for respondent states to fend off compensation claims and discourage ‘frivolous litigation’ by private investors. Julian Donaubauer is a Post-Doctoral Researcher at the Chair for Growth Theory and Business Cycles at the Helmut Schmidt University in Hamburg. Peter Nunnenkamp was a Senior Economist at the Kiel Institute for the World Economy prior to his retirement.